Won't the extraction be to a Ram drive in real conditions? So to answer my question, if you followed the instructions that you gave a link to, you formatted your whole USB drive as FAT32? Why not contact Corsair with step-by-step instructions on how to make the drive to show the issue. Explain that it only fails with the 128GB Corsair drive on every system but that it does work when run under QEMU. They should be able to reproduce your findings - in which case they can investigate the issue more fully (may be their firmware is buggy) - or they won't be able to reproduce your issue - in which case your drive must be faulty and they should replace it. I have seen many examples of firmware bugs in hard disks and SSD's in my career - what makes you think that there cannot be bugs in a 128GB USB 3.0 (new technology) Flash drive? I've posted it on Corsair forums too. It was formatted with FAT32 using BOOTICE. Previously I've tested with other formatting tools also. Edited by David Lynch, 13 January 2014 - 11:45 PM. 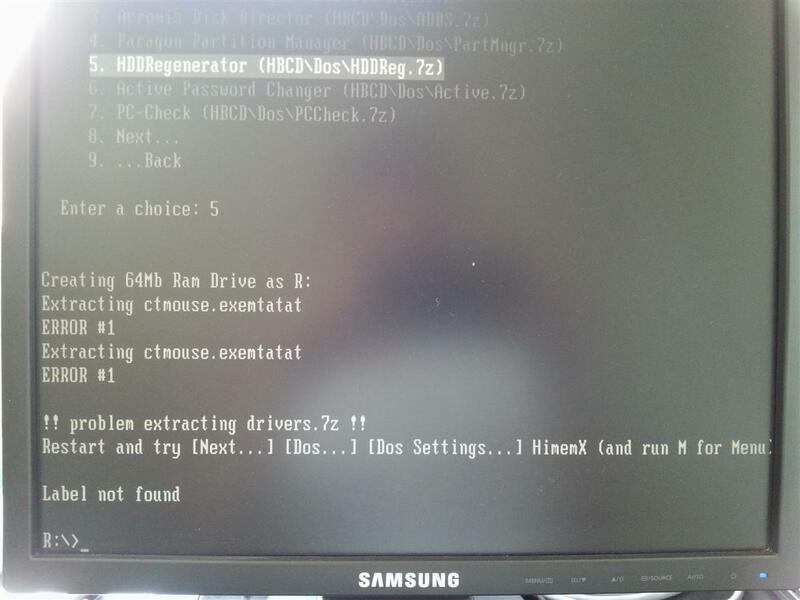 Have you tested both the default case (Hirens uses the \HBCD\DOS folder) and the case where you make the \HBCD\Boot\dos.img file using MiniXP by running \HBCD\Dos\dosimg.cmd? Do they both show the issue? Have you tested it when formatted as NTFS? You can run the Hirens DOS programs by choosing NTFS when the driver pop-up menu shows (rather than the default Auto). Can you try VBox - it would be interesting to know if you still get the problem? Also try formatting it as a 1GB FAT32 drive and see if the issue persists? I'll try the dosimg.cmd method, which I was not aware of. MiniXP has a menu for it? re. NTFS - it is a test - you don't have to keep it as NTFS. This is an investigation. The more evidence we can collect the better understanding we will have of the problem. For instance, do you have any other USB drive with Hirens on it that is FAT32 and 128GB or larger? DOS keeps then entire FAT table in memory - on a 128GB FAT32 drive this table will be pretty large and could cause memory space issues. If it still failed on NTFS then we would know that FAT32 is not a factor. The fact that QEMU works is highly suspicious and points to some sort of communication issue with the USB drive to my mind. Under DOS, there is no parallel I/O. DOS will ask for x sectors via the BIOS, the BIOS will ask the USB drive, the USB drive will get the sector data and then return the data via the same 'read' BIOS call and then DOS will use the data. Since this problem only occurs with your new USB drive and it occurs on every system you have tried, it may be that the USB drive is returning bad data at some point. The more clues we can gather the more we can formulate a theory and then test it and the nearer we can get to the true cause. This means doing lots of 'what if' test cases. The previous flash drive with exact same part number was working with the same procedures to prepare it, on FAT32. I will try the dosimg.cmd method as soon as possible. You mean the first drive you had worked with Hiren's but the 2nd drive you had doesn't! Why didn't you say that before!!!!!! Doesn't that prove that you have a defective drive? It was said that this drive was a replacement. So, it is the same, with probably a new hardware revision / firmware. I said that the exact same preparation procedure was tried for other drives. So, this one is the only with issues, that happens only at boot time: no 7zDec errors if running from Windows. Tried the dosimg.cmd Tried also another DOS setting, with HimemX - error again. You said it was a replacement, but you didn't say that you had no problem with Hirens on the first drive. I think the issue is quite plain. The first drive you had worked with Hirens, the replacement drive you have does not - therefore it is faulty - QED. Return it for a 3rd drive! Believe it: same error. Firmware/hardware revision issue. Could someone else reproduce this?